It’s half past midnight, I’m watching a man in a neckerchief up on a ladder wrapping a string of explosives around a flammable statue like Christmas lights. Another man — also wearing a neckerchief — at the base of the statue, is preparing a Molotov cocktail. As soon as the firemen arrive, they’re going to light the fuses and burn the statue to ash. 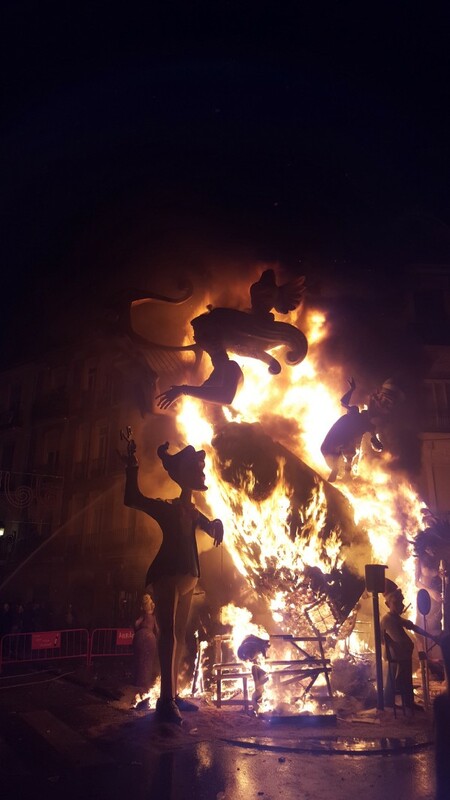 It’s the last night of Las Fallas, and all over Valencia, sculptors set fire to their own creations to mark the end of an eight-day round-the-clock party. Fallas is a mash-up of several celebrations, including St. Joseph’s day, pagan springtime rituals, and the traditions of local carpenters (for whom St. Joseph is the patron saint). Fallas is not one big party with a hub, like Mardi Gras on Bourbon Street, but a mess of block parties on every block in the city. Each neighborhood has its own sculptures and fireworks and dance tents. There’s no need to venture beyond your own corner to see most of what’s going on. There’s no hype, you don’t have to pay for anything, and there’s no need to make plans, because you can just step outside and follow the sounds of explosions. There aren’t many places that would compare themselves to a war zone as a selling point. But it says exactly that in the program of events on the Valencia City Guide. Continue reading in the Boston Globe.